Australia is a land of contrasts - topographical, cultural, physical, meterological and visual. About 40,000 years ago, the Aborigines were the first to settle. They lived as hunters and gatherers for this entire time, living with a close link to nature, although backburning and other poor agricultural techniques have since been realised to have caused significant deforestation, salinification of the soil and elimination of much of the natural diversity of the landscape. Such a poor ability to interact with nature, despite it being so important, helps explain why much of Australia is now unsuitable for sustaining life. Interestingly, this provides one of the few examples of where the native population damaged the land more than later waves of settlers. Their way of living developed into a complex culture based on oral tradition and intricate social bounds, which was almost destroyed by the second wave of settlers, who were able to populate the land with much more success. Australia is a nation in its own right, it is also a technically a continent, with large differences between regions. It has a reputation as a land of leisure, with sun, sea and an enviable 'Crocodile Dundee' outdoor lifestyle, but this is just a very narrow conception of a continent. The reality however, is that most people work all day, and then spend the weekend running around trying to pack life into the 2 days on the weekend. Only the homeless and tourists have time to sit around on the beach, or laze away days watching sport on TV. One of the states is the island state Tasmania of which one fifth is World Heritage area. Each state has its own national parks with their specific character where you can indulge in bush-walking or maybe even rock-climbing. When you're interested in the miracles of water-world, you can't miss out on the Great Barrier Reef on the east coast, the main reason for many travellers to visit Cairns. The Wet Tropics of Queensland comprise dense rainforests and foaming waterfalls. Rare species of animals can be spotted in the famous Kakadu National Park as well as ancient aboriginal art. These old drawings can also be seen in the Namadgi National Park. Good places to set off for exploration of the great outdoors are big cities such as Canberra, Darwin, Adelaide and Perth, that all have interesting sights and a good cultural atmosphere as well. Of course, Australia is surrounded by sea, so good swimming and surfing beaches are more rule than exception, generally these beaches will be full of only tourists, especially during the week. So fun can be had watching people who haven't heard of sunscreen yet turning into lobsters, or getting trapped in the surf. North of Brisbane, is the Sunshine Coast one of the many stretches of coast where you can find excellent beaches, South of Brisbane is the better known Gold Coast, famous for being home to Australias equivalent of trailer park people and teenagers who can't afford a holiday somewhere better. Don't forget the smaller historically interesting Alice Springs, or William Creek [the most isolated town in Australia] that will lead you right to the famous Ayers Rock. Deserts, rainforests, big cities….and just when you thought you'd caught a glimpse of the versatile character of this fascinating continent, you forgotten about Melbourne and the excellent skiing opportunities in the Alpine National Park. Another good option is the Snowy Mountains area in NSW. How many months could you stay? Sydney is probably the most beautiful city in Australia, and is the capital city of New South Wales. Sunny and very visited, most of tourists come to this city to see its major attraction the Sydney Opera House, one of the most famous buildings on the world, and it's also the pride of the city, of course there are other interesting buildings and monuments. Sydney is a very big city but the main attractions are located in a small area which is also one of the most luxurious areas in the city. 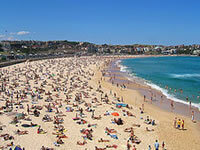 The beaches in Sydney are simply amazing, that's why they are crowded of people in summer time, there are more than 20 waiting for you, the most famous between them is Bondi, located seven kilometers away from the city centre, is very visited in summer and through all the year, many tourists come here to spend Christmas time. Manly Beach is also a very visited tourist destination, it's near the Sydney Harbour National Park, you can take the ferry to get there in thirty minutes or can take the fast Jet Cat catamaran to be there in fifteen minutes. And to come back from a fantastic day on the beach the best time to get into the city is at night, the lights of all the city gives to it a special view, you have to see the lights of the tallest buildings around Circular Quay looks like rainbows over the water of the harbor. Sydney population is of about five million people, you'll discover this city still has a small-town charm. In 2000 Sydney was the host city of the Olympic Games, all the city was full of visitors, journalists and sportsmen, there was a beautiful time in the city because of this. Sydney is also the dynamic centre for Australian economic activity and one of the most important cities for finance in the Asia-Pacific region. Built in 1893 as a market, the Queen Victoria Building is 200 m long 24.3 m across, with a 57.5 m high central dome. Was almost demolished but finally restored to its original shape in 1980, now it hosts 200 elegant shops open seven days a week. Located in Darling Harbour the Australian National Maritime Museum covers the eventful history of Australian seafaring with displays of ships and articles on those whose livelihood depends on the sea. Centered on Dixon Street with different Chinese regional restaurants to choose from, shops and markets, a temple and many offices, the Chinatown was formed by many inmigrants in the first half of 19th century who had increased to thousands after the gold discovery. Located in College Street, is the oldest museum in Australia and was founded on March 30, 1827, by Earl Bathurst. Now it hosts a big collection of valuable minerals and strange fossils to stuffed birds and mammals. The museum is also involved in indigenous studies research and community programs. St Mary's Cathedral has a neo Gothic style, built in 1868. The cathedral is dedicated to "Mary, Help of Christians", Patron of Australia. The site for a church was given to the first Roman Catholic clergy in Sydney by Governor Macquarie in 1821. The Royal Botanic Gardens in Sydney are the largest botanical gardens in Sydney, is located at the east of the Sydney Opera House, is mainly devoted to exotic and native trees, with orchids and ferns in hothouses. This Museum was opened in 1991 and is dedicated to exhibiting, interpreting and collecting contemporary art, from Australia and around the world. The Koala is native to Australia and you can have an unforgetable time visiting this sanctuary. You must visit this aquarium if you are in Sydney, definitely a beautiful under water experience that you'll never forget.